The photos are from the archives of Mr. Anwar Virani of Ottawa, Canada. Details have been compiled from Mr. Virani’s recollections and other sources, as noted. “Take as an example for your patriotism, your brothers in Burma, They have identified themselves 100 percent with Burma. They don’t look across the border. Whatever country you choose to live in, work for it, mix with its people, achieve its outlook and keep religion in its proper place – in your soul. If you do this, you will find many of your problems solved. When you live in a country you become a member of that country.” (reported in The East African Standard, Nairobi, 8 June, 1951). This would suggest that the photograph is from 1914. By the 2nd World War many Ismailis had already assumed Burmese names. A great tragedy befell the Jamat when the British launched heavy bombardment on Rangoon. The resulting outcome was heavy damage to the Jamatkhana located at Mughal Street, which resulted in the loss of 31 innocent Ismailis on April 15, 1943. The Imam crowned the martyrs with the title of Shahids. 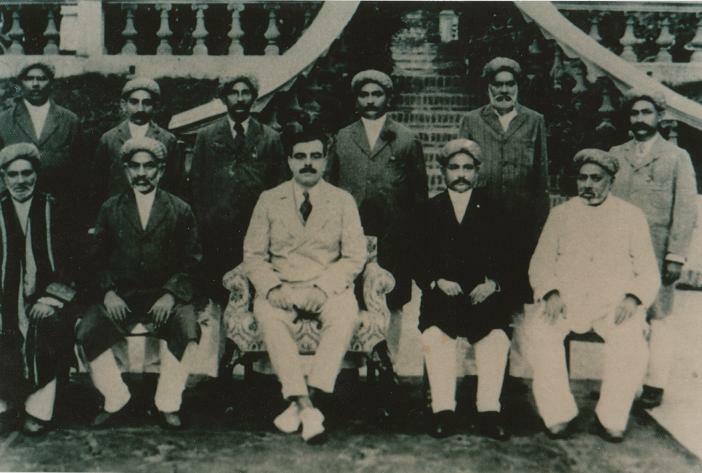 When the war ended, one of the leading Jamati members, Wazir U Kan Gyi, undertook the responsibility for the Jamatkhana renovations which were completed in 1949. The official opening ceremony of the renovated Jamatkhana was performed on January 5, 1950 by Thakin Nun, the then Prime Minister of Burma. 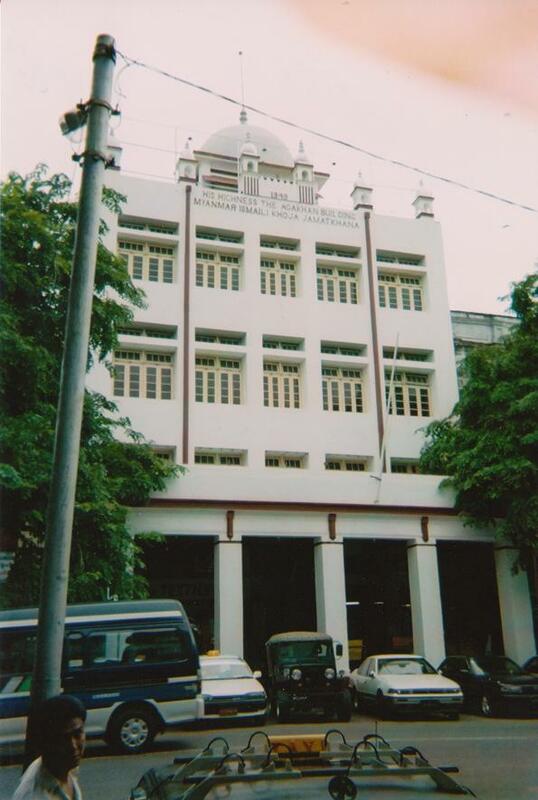 The photo above is a more recent photo, but shows how the Jamatkhana has stood since the earlier renovations. Later, the Imam sent a message saying how much he thought of the persons who were martyred during the war and recommended that a memorial plate bearing their names should be placed outside the wall of the Jamatkhana or in the library. Plaque has names of the "Shahids" who died from the bombing on 19th April 1943 and also includes names of others who lost their lives during the war. Photo: Anwar Virani Archives. The last visit by Imam Sultan Muhammad Shah to Burma was made between January 20, 1951 and January 26, 1951. Note: Burma is officially known as Myanmar since 1989. The former capital, Rangoon, is now called Yangon. Also, read below an interesting feedback from a reader who resided in Burma. SOME VIVID RECOLLECTIONS FROM AN ISMAILI WHO RESIDED IN BURMA. I have read the article and seen the photos with interest and I am glad you have recorded this as part of your series. Of course the bombing was an extremely sad day for us and I wish to expand on this and a few other matters a little bit. (1) The bombing really went wrong. The actual position of the Jamatkhana was next to a police quarter. The first bomb missed the target and when the second one came down it also missed the target but instead hit the Jamatkhana as both were in the same line. (2) Mawlana Sultan Muhammad Shah visited Rangoon with Mata Salamat in 1951. The arrangements that were in place were extremely well coordinated and there were approximately one thousand people in attendance for the Mulaqat with the Imam. A marriage ceremony was also held and the brides and the bridegrooms sat in front of the stage where Mawla and the Begum were seated. When the Imam and Begum later visited the royal reception in the presence of the Prime Minister, the Imam wore a magnificent Burmese costume. Then later when Mawlana Hazar Imam visited Burma in 1960, he was also photographed in a Burmese costume. That visit was remarkable because Hazar Imam celebrated Navroz with the Burmese Jamat and conveyed Navroz Mubarak in a Farman which is widely known and read every Navroz around the world. I migrated to East Pakistan (now Bangladesh) in 1965. Hopefully I can put together something about my migration experience – an 18 day journey from Rangoon to Dacca. First Floor: The religious education centre and other Jamati institutions such as health, scout, education were located here. 2nd and 3rd Floor were prayer halls. Both Hazar Imam and Mawlana Sultan Muhammad Shah visited these floors and gave Mulaqat to the Jamat. Jamatkhana has a lift for those who cannot climb the stairs. It is located in the centre of the commercial hub.